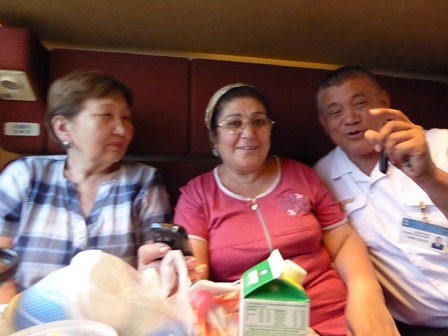 From Almaty I decided to take the overnight train into Shymkent. I hoped to see something of the Aksu Zhabagaly national park if I could manage it. I had booked a berth in a four- berth compartment. Not only do they provide freshly laundered bedding and a towel, they even provide a small toiletery bag with overnight essentials. This was like flying first class! There was also a paper cup with sachets of tea and coffee. Starting at 7:30 pm meant a couple of hours of daylight to see the land we were passing through. Outside the window lay vast stretches of rolling green grasslands, occasionallydotted with a few horses. There were hardly any buildings, let alone villages or towns. I asked the locals – my cabin mates, why the landwas not farmed. The soil is too poor they told me and there is too much salt. And indeed, thye pointed out large white patches of salt. This must explain why the price forof vegetables was twice that of meat in the restaurants and markets of Almaty. My cabinmates were two women and a gentleman. 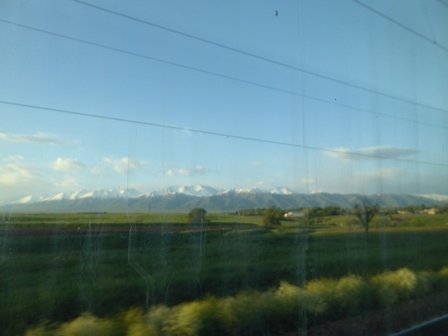 Gauhar had been visiting a friend in Almaty and wason her way home to Shymkent. The older gentleman had been on work and he too was on his way home. Sonia, the third person had been to her nephew’s wedding and was returning home to a village a couple of hours out of Shymkent. Sonia is one of those people with an exuberant personality. Loud, outspoken, with a great sense of humour, she was cracking jokes fromthe minute she stepped in and had us in stitches. I was laughing as hard even before they could explain in a mix of Russian, Turkish and Kazakh. Where wonrds failed, miming worked quite a charm. The provodnik,or the wagon attendantcame by to check our tickets and stayed to join in the banter. Both he and Sonia are great fans of Bollywood films and he started chiming in with snippets of songs – he had them memorized without understanding a word! Quite a ham, he was playing up to Sonia in the best love-lorn hero fashion. 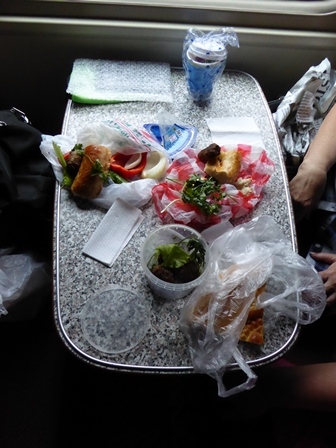 The rest of us cracked up until we had tears in our eyes and were spluttering over our food and drink. We had all taken out our bundles of food and shared. The little table bore a motely assortment – meat patties and greens,courtesy of Sonia, some slices of pizza contributed by Gauhar along with some bread, cheese and salad that was my contribution. All of polished off with cups of green tea that came with our paper cups. The evening passed quickly as did the night, albeit with a symphony of snores. Sonia got off around six in the morning, yelling her goodbyes. The clear morning light showed stretches of rolling green fields with a few farmhouses. Large stretches were tilled and some planted, I did not know with what. In the distance loomed the Alatau mountains, their upper reaches still with a mantle of snow and their lower slopes green. It was not just a room but a suite! The lobby was peppered with patients and theair had that distinct antiseptic smell peculiar to hospitals. I have no doubt that with my neck brace I would have fit in perfectly. Much as I appreciated their generosity, I declined and was dropped off at a hotel instead.